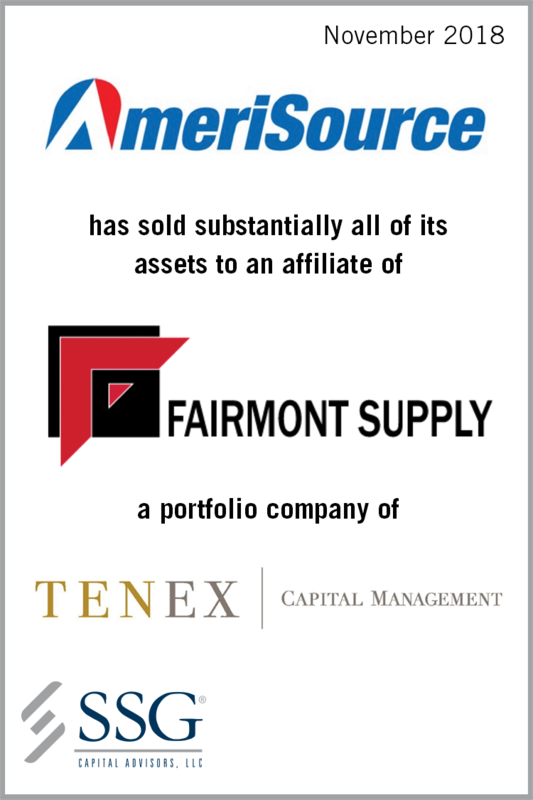 SSG Capital Advisors, LLC (“SSG”) acted as the investment banker to AmeriSource Industrial Supply Co. (“AmeriSource” or the “Company”) in the sale of substantially all of its assets to an affiliate of Fairmont Supply Company (“Fairmont”), a portfolio company of Tenex Capital Management (“Tenex”). The transaction closed in November 2018. Headquartered in Detroit, Michigan and operating since 1946, AmeriSource is an industry-leading distributor of maintenance, repair and operations (“MRO”) supplies with a strategic geographic footprint across the midwestern and southern United States. The Company’s supplies are consumed primarily by middle-market manufacturing and general industrial customers. AmeriSource offers a variety of MRO products for maintenance, safety, production, packaging, janitorial, facility, office and breakroom supplies. In addition to its extensive product offering, the Company provides its customers with varying, customizable levels of value-added supply management services within customers’ facilities. SSG was retained by AmeriSource to conduct a comprehensive marketing process and solicit offers for the Company. The process attracted significant interest from multiple parties which engaged in a thorough review of AmeriSource and submitted offers for the business. Fairmont, a portfolio company of Tenex, submitted the most compelling offer which led to an optimal outcome for the Company and its stakeholders. Fairmont distributes industrial MRO supplies throughout the United States. Tenex is a private equity firm that invests up to $100 million of equity in middle market businesses and facilitates long-term value creation through operational change. Brendan J. Cahill of Dykema Gossett PLLC, counsel to AmeriSource Industrial Supply Co. shareholders.